Ian Green. This is my blog where I talk about my work in financial services as well as other bits and bobs from my life. The idea is that prospective and existing clients can read more about me, what I do and how I do it. You can view my website at www.iangreen.com where you can also find how to get in touch. 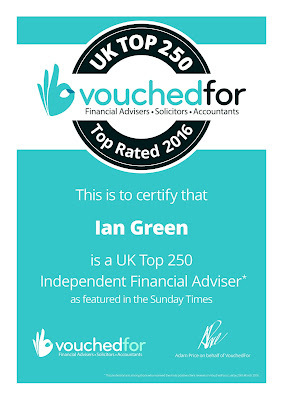 On Sunday 10th April the Sunday Times published their first supplement listing the Top 250 IFAs in the UK based on reviews on the independent consumer ratings website VouchedFor.co.uk. I am proud to say that I was featured. To be included I have been highly recommended by 91 of my clients. All had rated his services over 4 stars out of 5, which is a fantastic achievement. In fact, as I write this, I have an average rating of 4.9 out of 5 from 101 clients. I'd like to thank all of the clients who took the time to share their positive feedback on VouchedFor.co.uk. Comments Adam Price, Founder of VouchedFor.co.uk: “At VouchedFor we’re passionate about helping people find great financial and legal advice. At certain points in life the majority of us would benefit from expert help with complex issues such as pension planning, securing a mortgage or for advice on a legal issue. Listing professionals alongside verified reviews from their existing clients makes it easy to find a respected and trusted expert like Ian to help. 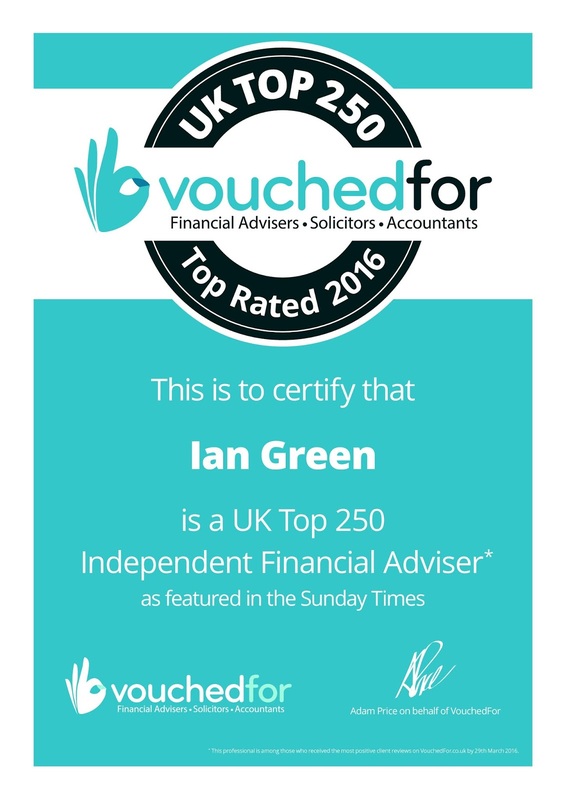 We would like to congratulate Ian on being one of the Top 250 - it’s a great endorsement of the service Ian provides." You can see my reviews by going to https://www.vouchedfor.co.uk/financial-advisor-ifa/southfields/709-ian-green"
or Should the Tax Tail Wag the Investment Dog? I am indebted to Aviva, whose technical department posted the calculations bit of this blog on their information for advisers site. I've been asked a number of times already how I'll be changing portfolio make up with the new dividend allowance. It's one of those things that makes a great headline and an even better exam question. However, we should remember that we don't want the tax tail to wag the investment dog. As announced in the July 2015 Summer Budget the taxation of dividend income was set to change from 6 April 2016. People are now taxed on the actual dividend they receive. The old system of receiving a net dividend with an attaching 10% credit and grossing up no longer applies. In this Bulletin we look at how the system now operates and considers planning opportunities to maximise its benefit. As the new tax free dividend allowance can make a significant difference to investment returns its introduction should be used to review the appropriateness of tax wrappers. Particularly giving consideration to the taxation of the underlying asset classes within a portfolio to ensure the portfolio is held as tax efficiently as possible. The following simplified example illustrates the benefit of such a review. For tax year 2015/16 the dividends received within the ISA saved a 32.5% liability on the notional gross dividend and a 40% liability on the gross savings income. The overall portfolio remains exactly the same but now all the savings income is arising free of tax within the ISA and the dividend income is free of tax utilising the £5,000 tax free dividend allowance. This planning saves £900 of tax which represents 10.6% increase in the amount of income received. When switching the directly held funds so future dividends will benefit from the £5,000 tax free allowance consideration has to be given to any potential capital gain tax implications. Going forward holding all the equity based funds outside the ISA also gives the opportunity to manage and realise gains to maximise the capital gains tax annual exemption year on year. Mr Smith also holds a £50,000 cash reserve in bank and building society accounts so he will benefit from the new personal savings allowances which were introduced on 6 April 2016. This will ensure that the interest he receives (assuming annual rate of return of 1%) will be tax free up to the £500 pa limit for higher rate tax payers. Mr Smith has cash and investments totalling £350,000. Careful planning maximising the new tax free dividend allowance, the personal savings allowance and managing capital gains within the annual exempt amount means he is unlikely to pay any tax his investments during 2016/17. The example shows significant tax savings can be made by aligning asset classes within a portfolio to the most efficient tax wrapper. Back to me... So that's all well and good in the theoretical example. But what if the funds now held outside of an ISA do really well? Then the larger gains may be outside of the ISA tax efficient wrapper and because of the size of the fund, or because CGT allowance is used elsewhere (selling a second home for example), now subject to tax, thus wiping out any gains from reallocation in the first place. It's one of those things that is only really going to be known with hindsight. So we will continue as we always have done, allocating to assets and tax wrappers for our clients in the best possible way - on a personal basis for them - considering all the outcomes we can and whilst we always adapt and adjust to new information , regulation and taxation, we will also ensure that the tax tail is not wagging the investment dog. Finishing with a flourish GO hailed his third budget in a year as for the next generation. This Budget looked as if it would be a difficult one for the Chancellor, faced as he was with disappointing economic numbers and the need to avoid ruffling feathers ahead of June’s in/out referendum. What was to have been the big announcement – reform of pensions – was kicked into the long grass a few weeks ago. Nevertheless, Mr Osborne did spring a few surprises, including some tax reductions. How will this Budget affect you? If you are – or want to be – a saver, then there is plenty to consider. From April 2017 a new ISA, the Lifetime ISA, will be launched for the under-40s. It looks as if it is a close relation of the recently abandoned pensions ISA. Also from 2017/18, the normal ISA contribution limit – unchanged for 2016/17 – will rise to £20,000. Capital gains tax (CGT) rates will fall from 2016/17 to 20% and 10%, although the current rates of 28% and 18% will continue to apply to residential property (another buy-to-let attack) and carried interests. There will be a new entrepreneurs’ relief (effectively 10% CGT) for external long term investors in unlisted companies. · A restructuring of stamp duty land tax (SDLT) on commercial properties. · A major revamp of business rates, permanently doubling the Small Business Rate Relief. As usual, we are on hand to help you if you would like to discuss any of the issues raised in the Spring Budget in further details. We will be pleased to hear from you. Tax tables are available on our website. Exit the tube, turn right, cross the road at the crossing by the Co-op. Turn right, then turn left at Sainsburys. Follow Woodlands Way to the end and continue walking across the footbridge over the mainline railway. Turn left at the end onto Fawe Park Road and then right into Bective Road. Follow Bective Road into Bective Place. 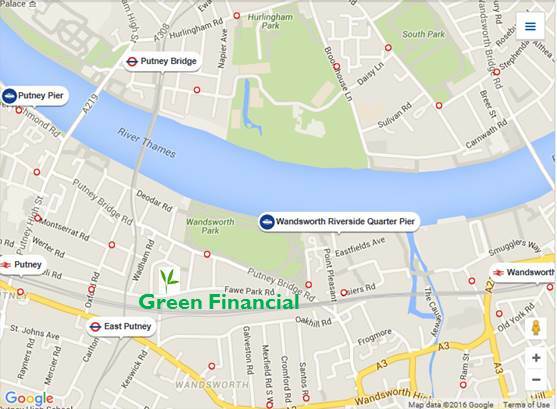 Green Financial is through the square white mews arch on the right. Bective House is directly ahead at the end of the mews. Exit the station, turn right, turn right again at NatWest bank into Disraeli Road. Cross Oxford Road using the crossing, then continue further along Disraeli Road. 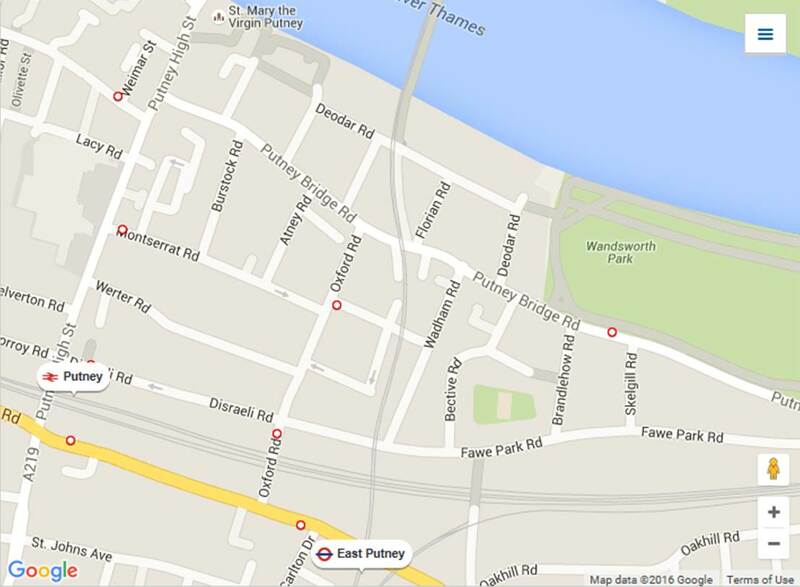 Pass under the railway bridge, past Wadham Road then turn left into Bective Road. 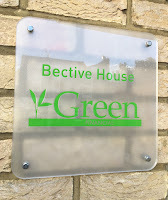 Bective House is directly ahead. From Bus Stop 'R', at the head of Putney Bridge, outside the Odeon Cinema, take a 220, 270, or 485 two stops along Putney Bridge Road to bus stop 'V' (Deodar Road). Bective place is opposite, across the main road. Green Financial is through the square white mews arch on the left. There are two spaces. Please let us know in advance if you will be driving so we can reserve you a space. The turn from Bective Place into the Mews through the square white arch can be quite tight if there are cars parked opposite. Watch out for the low wall if arriving from Fawe Park Road end, especially if you have a big car. The area in front of Green Financial is secure and private bicycles can be safely stored in our courtyard or chained up. There are a number of London Hire Cycles ('boris bikes', Santander Cycles) nearby. A particularly pleasant way to arrive and depart in the summer, if you like this kind of thing, is by boat. Travelcards, cash and Oyster cards can be used. 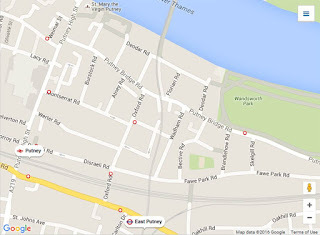 The map below shows that both Putney Pier and Wandsworth Riverside Quarter Pier are nearby. 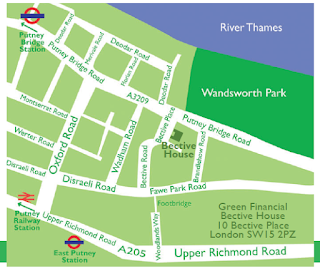 Please call us on 020 8877 7890 if you have any questions about your journey or would like us to provide you with a detailed set of directions from anywhere in the world. The recent rumbling in the bond markets is a reminder that investment risk is far from a thing of the past. Combined with the volatility inherent in equity markets, it is worth investigating further my mantra of ‘time in the markets, not timing the markets’. Rather than trying to call the market, yet again, time might be better spent considering the right and wrong ways to manage the impact of market turbulence on an investment portfolio. The temptation, which can seem intuitively powerful, is to adjust a portfolio in response to events or trends perceived in the market. But data show the opposite is often right: investors are typically better served by ignoring market noise and maintaining their original asset allocation through a disciplined rebalancing schedule. The best approach, in my view, is to embed portfolio rebalancing into an investment plan at the earliest stage, emphasising that the purpose is not to maximise returns but to manage risk. What if the drifting investor fled from stocks after the 2008 plunge? 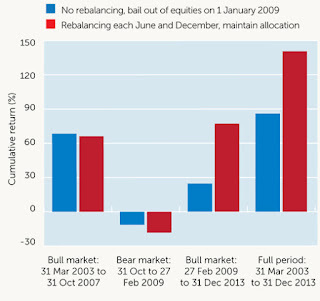 A sterling investor who maintained a (hypothetical) portfolio of 60% global equity and 40% global bonds through the whole of the last market cycle, from 31 March 2003 to 31 December 2013, rebalancing twice a year, would have had a cumulative return of 140%. 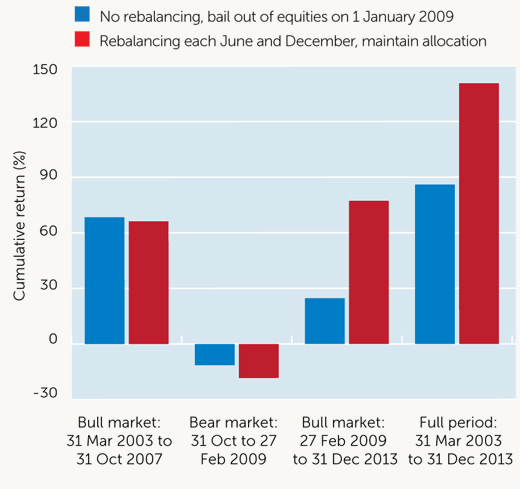 An investor who switched out of equities at the bottom of the market, in January 2009, far from saving themselves or their capital, would have reduced their cumulative return for the full period to 86%. Looking at a 60/40 portfolio over the longer term produces some interesting results when comparing a portfolio that is rebalanced with one that is not. Over the period 1960 to 2013 a portfolio rebalanced annually returned slightly more, 10.35% compared with 10.08% to one that was not rebalanced. But the volatility, as measured by standard deviation, was significantly less in the rebalanced portfolio, 19.7% against 21.97%. A simplistic interpretation of this result would be that the value of rebalancing is 0.27 basis points (bps): 10.35%-10.08%. This would be a misleading measure, however, mainly because the sign of this effect could be positive or negative, and on average it is likely to be negative. On the basis that rebalancing is about managing risk, the emphasis should be on the difference in volatility. 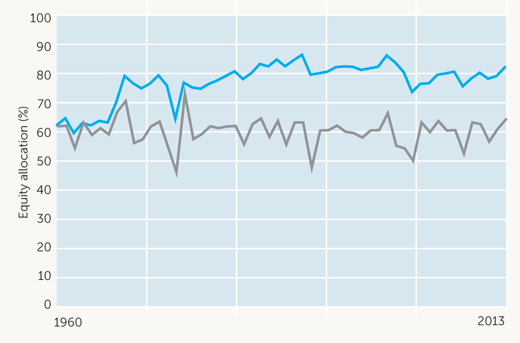 A portfolio with a similar long-term risk profile as an unbalanced 60/40, using the same portfolio constituents as above, is close to a rebalanced portfolio 70% equity and 30% bonds, the annualised volatility of these two portfolios being 21.67% versus 21.97% respectively. Over the same period, 1960 to 2013, the 70/30 portfolio returned 10.51%, a full 43bps more than the unrebalanced 60/40. Under these assumptions, the value of rebalancing can be assessed at 0.43% per annum. The above example uses a simple time-only rebalancing strategy but more sophisticated approaches are also possible. A time-only strategy will rebalance on a given date, regardless of the relative performance of the portfolio’s component assets. In a threshold-only strategy, rebalancing is triggered when a portfolio’s asset allocation has drifted by a given amount, regardless of how often this happens. A strategy combining the two will monitor the portfolio on a given schedule and have pre-set thresholds, but rebalancing will only occur when the two trigger points cross. Over the long term, the data show the optimal time-and-threshold strategy is probably to monitor the portfolio annually and to make adjustments when the drift is 5% or more, bearing in mind that rebalancing attracts costs and taxes. The precise value of rebalancing will always depend on the behaviour of the markets and the nature of the assets in the portfolio, as well as costs. Those who maintain disciplined rebalancing through episodes of exceptional volatility will tend to gain most. But the key issue is that a rebalanced portfolio is one that remains focused on the investor’s goals. Peter Westaway is chief economist and head of investment strategy group at Vanguard Europe. I recently attended the 10th Citywire New Model Adviser conference. 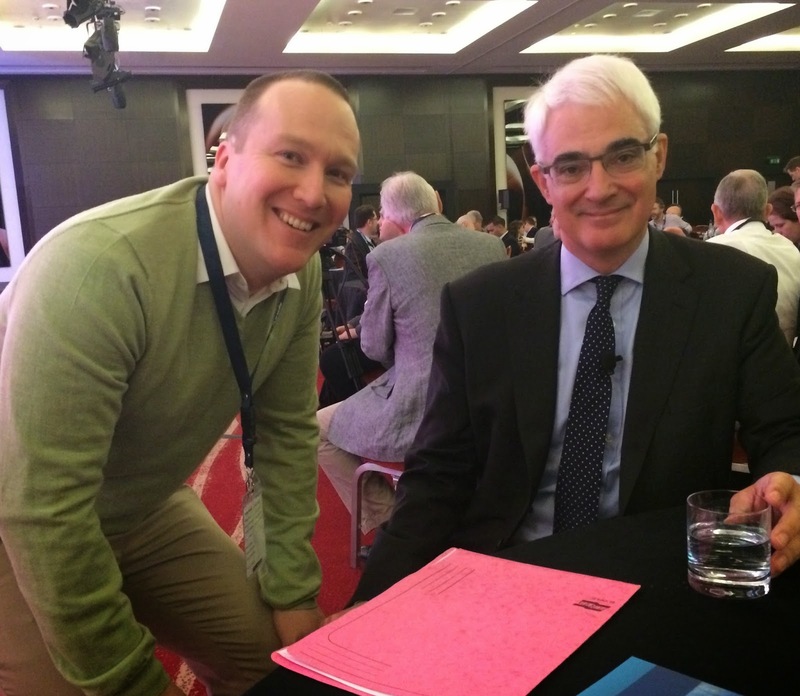 The Rt Hon Alistair Darling MP was the keynote speaker. He told an interesting story about how, in the depths of the financial crisis, he finished a meeting with bank board members and they took him aside and confidently told him "As a board, we've now agreed, that in future we'll only take on risks we understand" ! He added that if you live in the UK, you still own part of this bank! He was also asked, during his 1,000 days in office, what was his worst moment. He started his reply by saying he was rather spoilt for choice! He said that the financial crisis problems arose when the banks didn't understand the risks to which they were exposed. 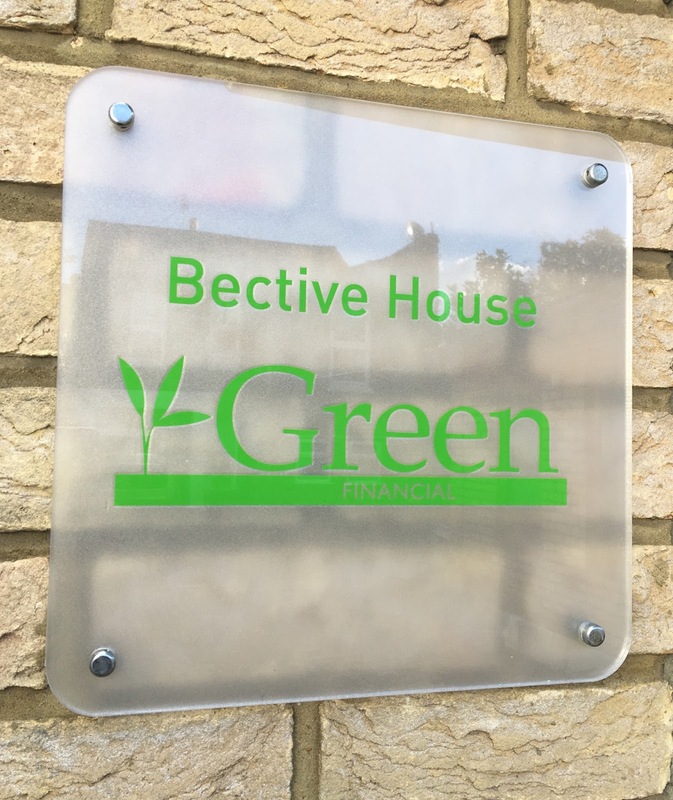 It occurred to me that is a big part of what Green Financial do for clients; helping them to ensure they are only exposed to appropriate risk. In closing, he was not confident. He says treasury officials say "The real problems will come when we hit the recovery" - ie when interest rates go up, because we (the nation) have been used to low interest rates for so long, and we still have a massive level of personal debt. I'm delighted to announce I have been awarded this charter mark again in 2014, having first obtained it in 2008. This standard specifies requirements and provides a framework that applies to the ethical behaviour, competencies and experience of a professional personal financial planner. As an Independent Financial Adviser providing personal financial services it is important to keep up to date with the latest best practice guidelines. 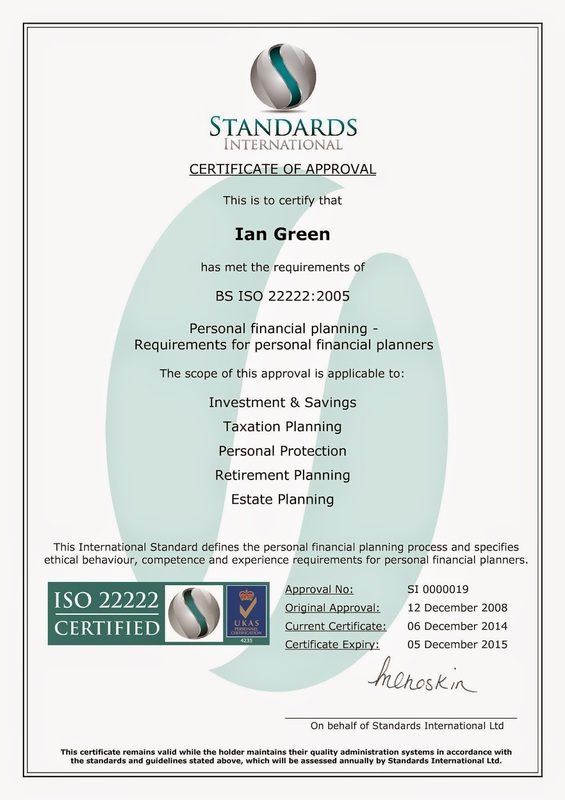 BS ISO 22222:2005 was created with the objective of achieving and promoting consumer confidence by providing an internationally agreed benchmark for a high global standard of personal financial advice. By adhering to the requirements of BS ISO 22222 I am are able to demonstrate commitment and dedication to continual improvement and ensure that client satisfaction is at the core of my business culture. Hold an appropriate qualification that assesses Financial Planning knowledge at an advanced level.